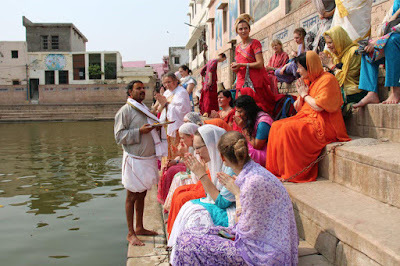 Day 6 of the pilgrimage was a very special day as it was Akshaya Tritiya, as well as, the main bathing day for the Kumbh Mela happening in Ujjain. During the day we celebrated our own version of the Kumbh Mela by taking a dip in Radha Kund and doing puja to Govardhan. The Govardhan Hill has immense spiritual importance among the devotees of Lord Krishna. After Krishna protected the inhabitants of Vraj from the wrath of Indra, He counselled them to worship Govardhan Hill, for which they did through Puja and a Parikrama around the hill. In the evening we celebrated Akshyay Tritiya by visiting the Banke Bihari temple. Akshyay means something that does not perish, or in more simple words, you do not suffer any loss on account of it. All the acts performed on this day become perennial in nature. The ancient wisdom teaches us to give, to donate for a noble cause, and to look for the divine blessing on this day. On this day it is common for everyone to visit the Prince of Vrindavan, Sri Banke Bihari Ji. It is only on this day throughout the year that devotees get a chance to see and admire the beauty of His feet. As sung by exalted and divine devotee, Saint Surdas: this is by the grace of Darshan and Dhyan (meditation) of the Lotus Feet of Lord that all impossible things become possible in the world. The lame can cross high mountains, the blind can see each and every thing, the deaf can hear, the dumb can speak and the poor can become rich and powerful so as to be honoured to move with Chhatra (ceremonial umbrella, generally used in grand processions). 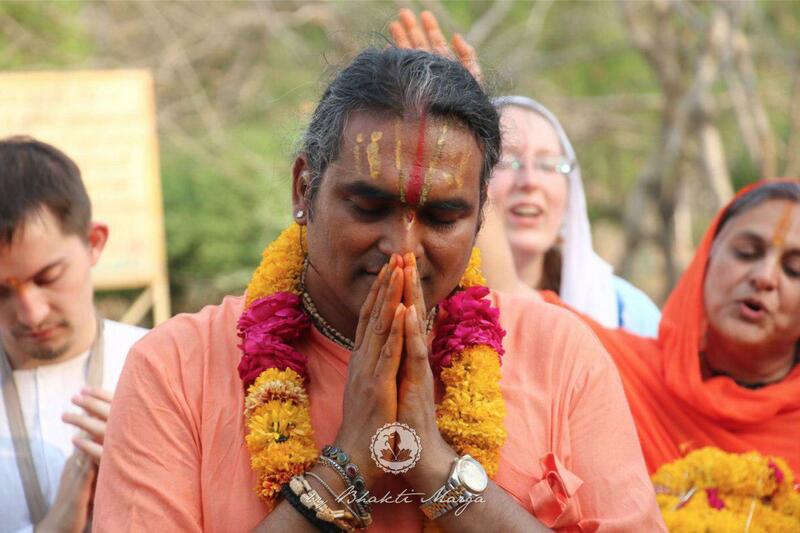 Sri Swami Vishwananda and the group visited the Banke Bihari temple in the evening for Darshan. It was extremely crowded and there was a lot of pushing happening, but everyone in the group was lucky enough to get a glimpse of the murti. The evening Darshan of the Lord carried an even bigger blessing as he was only wearing a dhoti (loincloth) around his waist. It is called the Sarvang Darshan – Darshan of the whole body of Shri Banke Bihari Ji. It was definitely the most action packed day of the pilgrimage. As day 6 was filled with events, day 7 was more relaxed and a fitting end to the pilgrimage. 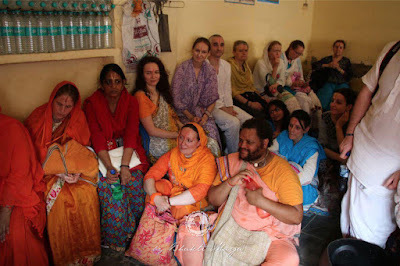 The participants were given an opportunity to spend some personal time with Swamiji as well as go shopping before concluding the pilgrimage. The day ended as we celebrated Sri Ramanajua Acharya’s 999 birthday and wished Swamiji farewell to the airport. 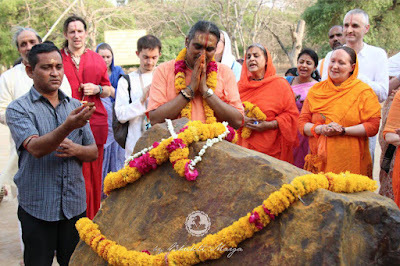 As with every pilgrimage with Sri Swami Vishwananda and Bhakti Marga, it was filled with external and internal experiences that can only be had by the grace of the Master, by "following the Master" wherever He may lead you.